Thank you for stopping to play with us at National Night Out on Tuesday, October 2nd. Wylie Recreation handed out 100 goodie bags (and ran out of bags!) plus 250 Activity Menus from the Wylie Recreation booth. For everyone that received a Wylie Recreation goodie bag, we hope you enjoy the mini frisbee, pedometer and magnet! 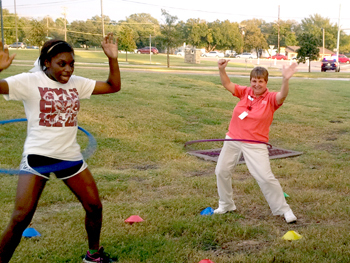 We had a great time hosting a hula hoop contest, mini basketball toss, crafts, Twister and other activities. 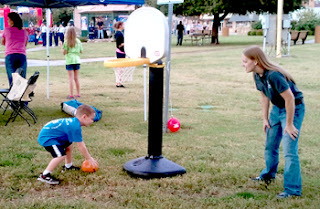 Wylie Recreation Center will be out on the town, again for Boo on Ballard, Thursday, October 25, 2012, 6 – 8 pm. We will have bounce houses set up at Bart Peddicord Community Center, and for those adventure-driven-types, visit the zip line NEW to the event this year at Olde City Park. Stay tuned for more info.